After two days of serious articles about the future of Avios and BA Executive Club, I thought we’d do something lighter today! I visited the Icehotel in Jukkasjärvi, Sweden yesterday and thought you might like to see some pictures and a video. We didn’t plan to come here but it turned out to be near to where we are staying so we took a trip over. the permanent Icehotel 365, which looks like the temporary Icehotel when you are inside but is actually a standard concrete block building with an exceptionally strong cooling system! You do NOT stay in the Icehotel for your full stay. It is obviously impractical. Most people book a cabin for a few nights and then choose to spend a night on the ice, with all of their luggage etc remaining in the cabin or, if it is the first or last night, in storage. 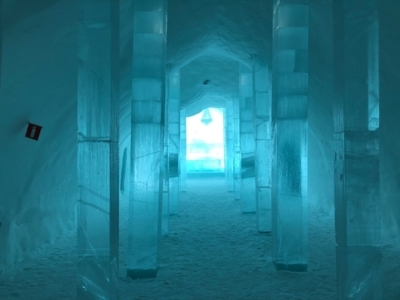 The temporary Icehotel is just a collection of rooms plus a wedding chapel. 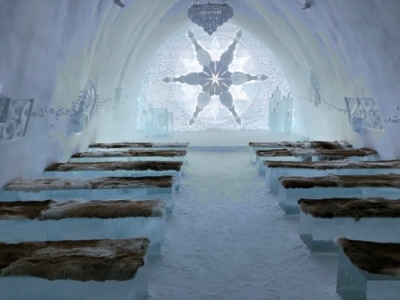 Icehotel 365 contains the Icebar and some larger, and arguably more impressive, rooms. The standard hotel has the usual mix of bars and lounges. Day visitors are welcome. The hotels are empty during the day with the rooms left open as guests move across from their cabins in the evening and leave at breakfast. A family ticket for four to tour both Icehotels was 699 Kr (£60). You need to treat Icehotel as an art gallery rather than a hotel. And, from that perspective (since it is clearly hopeless as hotel, having no facilities other than blocks of ice to sleep on) it is a huge success. I’m genuinely not sure I’d want to spend a night here. As a work of art it is fantastic, but as somewhere to stay ….? The cabins in the main hotel are also low on luxury, but this tends to be the ‘back to nature’ style in this part of the world and we have something similar at our own cabin at our hotel. For a better view of the hotel, take at look at the video below. This also includes some shots of Icehotel 365, the all-year hotel next door. If you can’t see the video below, you will find it on our You Tube page here. You can also subscribe to our channel via the same link. The hotel website is here if you want to find out more. Kiruna Airport handles 2-3 daily flights from Stockholm from SAS and, depending on season, Norwegian. 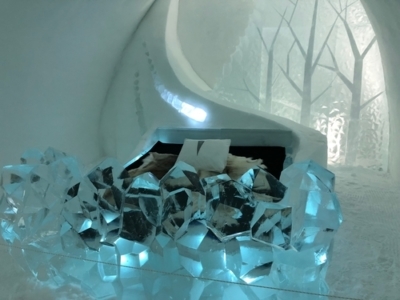 Yes, these ice hotels are just a gimmick, but people who have paid a lot of money for the “experience” rarely say so! We went to Harbin northeast China for the ice festival and the Shangri-La where we were staying had an ice bar and restaurant extension built each winter. We had booked in the restaurant but my wife took one look at the miserable looking seriously heavily dressed people and baulked. She was very right! The bar was good fun for a short while with glasses made of ice that you throw against the wall after the drink. No plumbing in the ice rooms. This looks great but for a much cheaper alternative, try Levi in Finnish Lapland. We booked a whole week there through Inghams ski company on half board with almost daily activities for a lot less than the sky high prices listed here. Thirded – been twice about 15 & 20 years ago and would happily return. Was thinking that when I read the article. Didn’t remember paying that much for the husky rides or seeing santa. Sadly, I think you have missed a lot of the detail about the Ice Hotel, which I have visited and stayed at 3 times. Yes, you stay one night ‘on the ice’ as you put it – but you are issued with fantastic thermal sleeping bags – large ones – so you are not covered by the reindeer skins, which form a layer between you and the ice. You change in warm, private cloakrooms and then walk through into your room. There are toilets, showers and a sauna in this area so you are not cold when doing any of those things! The ‘Warm Rooms’ in the permanent hotel are very comfortable, with all modern facilities. It is an expensive stay – but the setting inside and out is simply stunnng. Generally, in February when we were last there it is -40 outside (but for all excursions you are issued with thermal layers, hats, gloves and jackets) and -5 inside the hotel and Ice Bar (which, strangely, makes inside feel warm…). 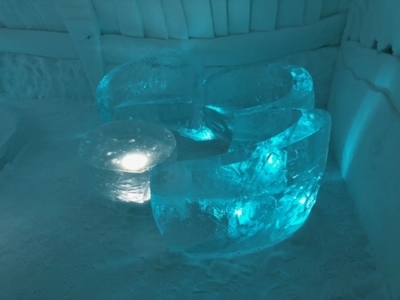 The restaurants are excellent at the Ice Hotel, with excellent use of local cuisine. We were lucky to experience several Northern Lights displays – once during dinner, when everyone just went outside to enjoy the spectacle. 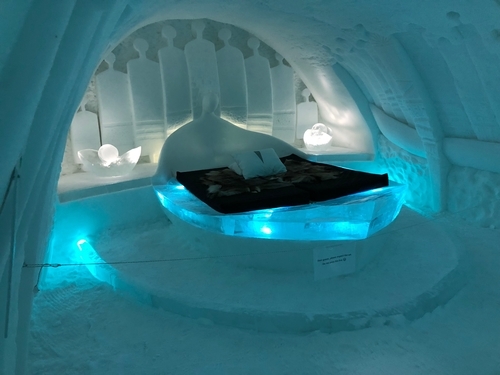 I have no connection with the Ice Hotel, other than a very happy guest on each visit, and I wouldn’t want anyone to be put off by comments about cost or comfort! Agreed! Was the trip of a lifetime for us and we remember our night at the ice hotel very fondly. We had one night in Abisko in an overpriced hostel but guaranteed northern lights and one overnight husky adventure and wilderness cabin. My only regret was spending £350 each on SAS/ Norwegian flights to Kiruna. Using RFS to Stockholm and train didn’t cross my mind. ???? nothing was cheap about the trip but excellent memories!!! Oh don’t make the mistake we did which was to rely on Public transport – simply not reliable. Thank goodness we found a taxi driver in the middle of nowhere one day! It’s too cold for hound children and we left our infant with grandparents but looks fun for much older kids! Fully agree with Matthew and Jo. As someone who’s also stayed several nights at the Ice Hotel (not simply visited as a day tripper) this review comes across as very jaded. Of course everything is expensive, rural Swedish Lapland isn’t exactly abundant with cheap foreign labour! We went snowmobiling, took an ice sculpting class and ate in the themed restaurants knowing how much these activities cost before arriving, none of it was a surprise. The key is to pre-plan transfers and activities to get the best rates, once you’re there you’re a captive buyer like you would be in any other tourist destination. Also as a guest you get free access to areas day visitors have to pay admission to. Their operation and infrastructure needs to be viable for 12 months of the year even though the visitor season is little more than 3 months. We knew full well how expensive the trip would be, still it’s one of the most memorable and enjoyable we’ve ever done and wouldn’t hesitate to recommend anyone to save up and immerse themselves in the experience. As you say, “We knew full well how expensive the trip would be”. Probably because someone like me told you. I’m certainly not saying don’t do it, and I’m not saying ‘don’t go to Lapland’ – I am just flagging up a key point. We are spending about 3x more than hotel bill per day on other stuff. That figure is usually about 0.5x. I don’t mean to be rude or lower the tone but that second photo down……..
Oh good, it wasn’t just me who thought they were giant icy phalluses. My wife took that one. I’m not sure I even went in that room! This icehotel reminds me of Hotel de Glace in Quebec province where my husband & I married just over 8 years ago – they have the same concept of annual temporary ice hotel set in the grounds of a regular hotel plus cabins. Staying in Hotel de Glace for our wedding night was genuinely magical & nothing at all to do with having just got married (I’m not sentimental like that). Also to echo another comment above – try Finnish Lapland instead & don’t get gouged like it seems you have been in Swedish Lapland. I’ve twice stayed at the Hotel Levitunturi in Levi too. We stayed there last Feb. The whole area has a lot to offer. We had no complaints. We were in Lapland this December with the kids. We stayed up north in Saariselka. We went to the bar on the first evening; beer 8 Euro, Sprite for the kids 4 Euro… and then the wife asked for a prosecco!! Out came the credit card. Agree, I am surprised that alcohol is reasonable (by London standards). Just been quoted £55 for a shuttle bus to the airport (15 minutes away) for four so we are taking a taxi at the bargain price of £35. Norway is the most expensive country in the world to buy alcohol and the border is just up the road! I was expecting the same here but it isn’t the case, although it is illegal for supermarkets to sell alcohol – the Government has a monopoly at retail. Supermarkets in Sweden sell alcohol just like they do in Finland. But they cannot sell anything with more than 3.5% alcohol content. That is where the state run off licence chains have the monopoly. Over the counter medicines like aspirin receive a similar monopoly at pharmacies in Nordic countries and supermarkets can’t even sell you a packet of Strepsils (which are counted as “medicine”). Thanks to that the prices for things like aspirin are 10x what you pay in the UK. Wait, sorry. I misread your comment as “alcohol is made everywhere”! Ignore Or delete please. 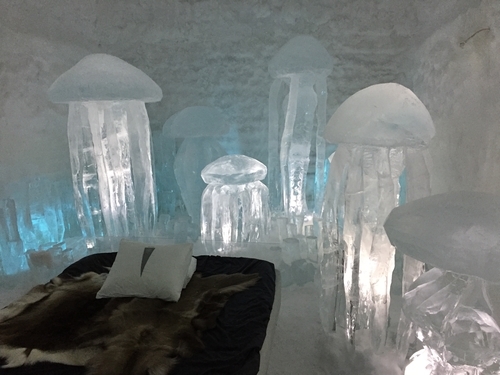 We stayed at the Ice Hotel last March and it was a fantastic experience. I agree IT IS VERY EXPENSIVE and I don’t think its the sort of place to do on a budget but if you can afford it and don’t fret about the cost the experience is worth it. We really splashed out and had one of the ‘suite’ rooms in the 365 building. With these you have your own private warm bathroom, changing room and sauna via an airlock at the back of the room. This means if you find the ice room too cold in the night or if you need to go to the loo in the middle of the night its not a trek! That said we found sleeping on the ice really comfy and had a fantastic nights sleep. In your sleeping bag its really quite warm. Seeing it during the day gives you a taste but staying there is needed for the full experience. I stayed in the ice hotel in Kemi in Finland many years ago and it wasn’t anywhere near as expensive as what is described for Jukkasjarvi. The best part of the trip was taking snowmobiles onto the frozen sea and joining an ice breaker mid voyage and a tour around the boat with lunch onboard. After that we put on survival suits and jumped into the open water the ice breaker had made (it was about -20 deg). It wasn’t too expensive but generally these things are cheaper if you book direct with the operator in Finland and not through some UK agency. I stayed here in 2013 before the 365 building was built. Had a fantastic weekend – although I wasn’t paying the bill. Had one night in the ice room and I couldn’t sleep due to being uncomfortably hot! They have some serious thermal sleeping bags and I had to keep mine half unzipped to try and find the right balance. When I was there they had the option of some smaller rooms in the ice hotel without the impressive sculptures for cheaper. I stayed there last year as part of a 4 day excursion including Tromso, Narvik and the ice hotel. The Arctic train, from Narvik to Kiruna in Sweden was spectacular. We were picked up at the train station and dropped off at the Ice hotel and everything was pre-paid so no need to even think about the money. It was an interesting experience. Pretty much as described by others already. My lasting memory was of how poor the service was – as soon as you go over the border from Norway waiters and waitresses suddenly go from being happy and helpful to miserable and sullen. I wouldn’t go back but glad to have seen it. I would spend more time in Norway next time if I get the chance. I’ve only been to the one in Quebec and thought it was good fun, certainly a bit different and we enjoyed the one night in the actual ice hotel (with a day of activities on either side). That was at the previous location since it moved closer to Quebec City a few years ago (but I assume it’s much the same). At the time, I remember looking at the various ice hotels and came to the conclusion that it was a lot cheaper overall for the holiday in Quebec than the equivalent stay in Sweden (from the UK). I get the actual ice hotel bit, but I don’t understand why anyone would voluntarily stay in a hotel made of concrete that is made to feel cold! 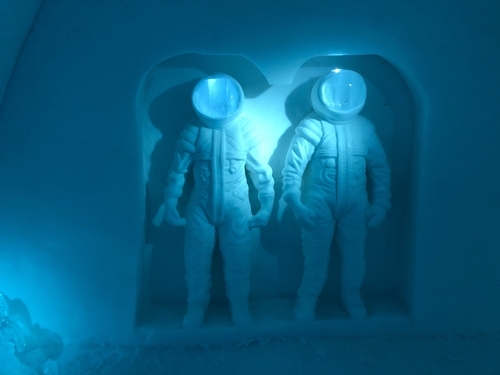 Anyway, Giles Coren and Monica Galletti made a programme about the ice hotel last year (BBC), very worth watching if it pops up again. They showed some of the artists working, as well as what it’s like to stay there. Hmnnn…..probably the £90 to use the pool (per session?) and £20 to sit in the lobby (per session?) would have been a deal breaker for us. I’d be tempted after a few days to claw some of this back by throwing a reindeer on the BBQ.